Legislative changes and market liberalization are helping the global legal cannabis market grow. Experts predict that by 2025, the legal marijuana market will grow to 146.4 billion dollars (an impressive CAGR of 34.6 percent). The time is just right to jump on the bandwagon and to make your first steps in the world of cannabis stock investments. Once you make the decision to invest in cannabis stocks, you will have to understand the market specifics and assess the various opportunities. Doing a bit of research will give you competitive advantage and enable you to add cannabis stocks to your investment portfolio. Step 4: When to Enter and Exit the Market? Marijuana companies specialize in the production of two wide ranges of products – medical and recreational cannabis. Medical marijuana is currently legal in 33 states and recreational products can be bought freely in 10 states. One of the biggest recent changes is the signing of the Federal Farm Bill – a regulatory framework that takes hemp out of the list of regulated substances. This is a major legislative change that will increase hemp farming and allow for even further market liberalization. Broad legalization efforts are also taking place in Canada, as well as other parts of the world. As the regulatory framework provides better conditions for cannabis cultivation and product creation, the market is bound to increase and so is the number of cannabis companies. There are several different categories of marijuana stocks you will need to get acquainted with if you want to invest adequately. These are the companies that support the business of cannabis growers and manufacturers. Ancillary service providers specialize in lighting systems, packaging solutions, hydroponics and other products/services marijuana growers and producers can rely on. Biotechnology companies in the field develop, test and produce pharmaceuticals that are based on cannabis. These are the obvious companies you should consider when planning to invest in cannabis. These are the companies that grow and cultivate marijuana to distribute the end product to either customers or companies making cannabis products. Many companies operate in each of these fields. When assessing one opportunity or the other, you should pay close attention to several aspects of corporate operations. The management team, the company’s growth strategy, financial results and the company’s cash position should all be examined. Luckily, such information is typically available on the corporate website. Essentially, you will need to acquaint yourself with stock market investing before considering the different marijuana companies. Our stock market investment guide will take you through the key steps and pinpoint the opportunities you can rely on to become rich. Apart from the key stock market factors you have to examine, there are specifics pertaining to the cannabis market that will determine the attractiveness of one opportunity or the other. If you are considering marijuana growers, for example, you should pay attention to the cost of cannabis production per gram. Companies that offer a lower cost are more competitive, especially on a market that’s growing and evolving rapidly. Local companies that also have well-established international operations could provide additional advantages. As already mentioned, countries in Europe, Asia and other parts of the world are going through changes in their regulatory framework. Such changes could enable extensive market liberalization in the near future. This is an opportunity the cannabis company you’re interested in should be ready to pursue. Take a look at the distribution agreements and the partnerships already in place to facilitate the sustainable growth of the respective cannabis business in the future. In essence, you can do two different things when planning to invest in cannabis stocks. The first approach involves the so-called fundamental analysis. Fundamental analysis focuses on the key company characteristics (not necessarily the ones pertaining to the respective industry) like the financial information, quarterly results and income statements. Technical analysis is the second option. Technical assessment focuses on price performance and stock price patterns that will be used to predict the future prices of stocks. Carrying out technical assessments is more challenging and you will have to trace a bigger number of KPIs to get adequate results. If you’re not confident in your skills and you believe that you lack the knowledge to invest properly, you may want to consider a bit of outside assistance. Opportunities like Acorns may be right for you. Please check out our comprehensive Acorns review to understand exactly how investment will be simplified and automated trough the selection of the platform. Even if you want to build an investment portfolio on your own, opportunities like Acorns will come in handy to achieve a bit of diversification. If you sign up for Acorns now, you will get a five-dollar bonus – click here to get started. Making extra money is heavily dependent on being strategic about it. Check out our comprehensive guide that will acquaint you with a big number of strategies for making extra money. 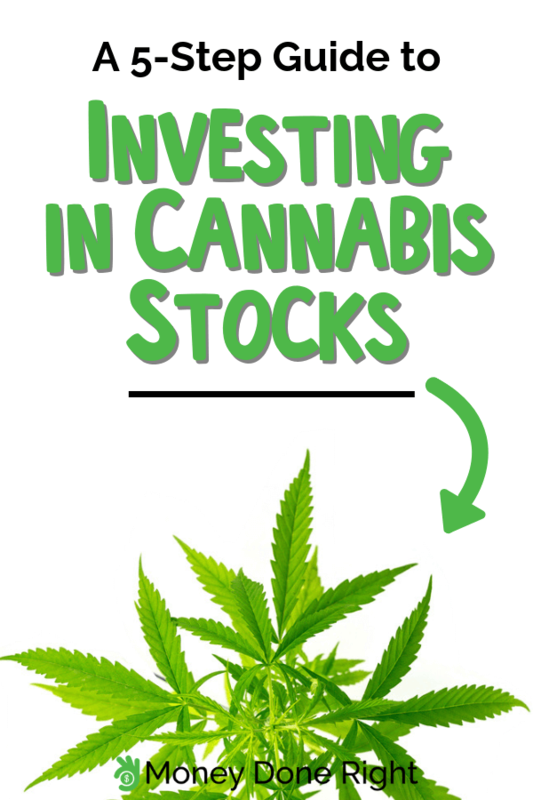 Investing in stocks is one of the solid opportunities but understand the fact that cannabis stocks are not created equal. If you’re hesitant about analyzing company performance on your own, you may want to go through reports about the market’s strongest performers at the time being and the most promising industry representatives. As of the end of 2018, these are considered some of the best cannabis stock investment options. CGC stock is currently trading at just under 50 dollars per share. In the last three months of 2018, CGC stocks nearly doubled in price and the company has a long and well-established history: in 2014, it became the first cannabis stock to be publicly traded in North America. CGC has well-established partnerships like the one with Constellation Brands – a prominent alcoholic beverage maker. This Canadian cultivator has production capacity of approximately 100,000 kilograms per year. The company is also known for its extensive international growth and the establishment of solid distribution channels. CannTrust has a global patent on a zero taste and zero calorie THC/CBD soluble. This one will obviously enable the company establish its positions in the global cannabis beverages market. CannTrust has been founded to produce pharmaceutical-grade standardized cannabis. Over its years of existence, the company has managed to accomplish just that. Since its IPO in July 2018, the Tilray stock has been estimated to grow nearly 600 percent. Originally, the company stock started out at approximately 20 dollars and by the end of 2018, it reached 170 dollars. The company specializes in the production of medical cannabis products and it has been labeled one of the most promising and most controversial cannabis investment options. After the initial growth, there was a slowdown and a crash but stocks have managed to stabilize at 100 dollars. Analysts suggest that such a company should not be dismissed as a bubble and potential investors should understand the fact that it does have a lot to offer. While the performance of Aurora Cannabis on the stock market has been somewhat shaky, this is yet another company worth watching. In 2017, Aurora Cannabis stocks went from being completely unknown to the hottest topic of Wall Street discussion. Recently, the company made headlines through the acquisition of Farmacais Magistrales – the first and only Mexican importer of raw THC materials. This acquisition is expected to provide Aurora Cannabis with a solid Latin America distribution channel. While the company’s performance is still uncertain, steps undertaken to ensure stability in 2018 could potentially pay off in 2019. Previously called CannaRoyalty, Origin House is one of the niche companies dominating the Californian market. The North American is building a prominent logistics platform in the world’s largest regulated cannabis market (California). The portfolio of Origin House assets is also diversified – it features research, intellectual property, distribution channels, partner products and infrastructure. As of now, Origin House has 450 California-based dispensaries and 50 popular brands in its asset portfolio. These are just a few of the possibilities but they’re obviously not the only ones. if you’re wondering where to invest in cannabis stocks, do focus on the US and Canadian markets. The biggest gains over the past few years occurred on the Canadian market. Keep in mind, however, that Canada is expected to account for solely 12 percent of cannabis sales in 2019. Thus, there are many other possibilities worth exploring due to anticipated market dynamics. US companies will make big money in 2019 because of the changes in the legislative landscape. The US market is expected to grow significantly and when it comes to stock investments, size does matter. While all of this information is sufficient to make your first steps, you may still feel hesitant about the development of the right investment strategy. If this is the case, additional tools may be required to get good results. Betterment is one such tool that really works. Check out our Betterment review to learn how it can be used to make money in 2019. In essence, Betterment is a tool new investors can use to figure out their financial goals, get expert advice and identify the right opportunities. Set up your Betterment account now and get up to one year of investment management for free. Assessing the performance of companies is one thing but when should you invest in cannabis stocks and when should you exit? A successful investment will require a long-term view of the market itself and the development plans of the respective entity itself. Short-term price fluctuations occur in every market and they’re inevitable. Such a view shouldn’t scare you and discourage you from picking one investment opportunity or the other. If you are risk-averse, pay attention to industry news in order to determine upcoming developments. The cannabis industry was on fire in the summer and fall of 2018. Things have slowed down since then but the prognosis is still positive. Experts suggest it’s not too late to get on the bandwagon now. As you’ve seen in the beginning of the guide, the predictions focus on rapid expansion of the global cannabis market in the years to come. The stocks of leading cannabis companies can be expected to continue appreciating, especially if these businesses have a solid strategy and their financial performance is stable at the time being. Knowing when to enter is one thing. Knowing when to exit is equally important. Understand the fact that the marijuana sector is still emerging. This means there will be a lot of speculation and fluctuations in the years to come. Determining when to leave with 100 percent accuracy is impossible. But you should opt for this investment option if you’re looking for something to commit to in the long run. A word of caution here – new markets are not best suited to the needs of young and inexperienced investors. Greener investors don’t have the patience of those who have more experience. Hence, inexperienced investors could make rash decisions on the basis of unreliable information or momentary developments. To time your exit properly, you will have to educate yourself about investing and about the cannabis market. Market analysis can be helpful but you have to know a few things when relying on such resources. For a start, make sure that the analysis is trustworthy. Trustworthy industry analysis is created by a reputable institution or entity rather than an anonymous author. The qualifications of the entity, their experience with the cannabis market and the evidence presented all matter. To sum it up – cannabis is a long-term growth industry. This, however, doesn’t mean you can invest in cannabis stock and forget about the endeavor. Cannabis investors need to be highly tactical and they also need to think in terms of diversification to create a balanced portfolio. Diversification can be accomplished in two ways. The two things to think about include investing in different types of cannabis stocks and also making the acquisition of cannabis stock a part of a larger, more varied investment strategy. Many newcomers to the world of investment will opt for one trendy option and they’ll rely entirely on this opportunity to get a high ROI. This isn’t how general or cannabis stock investment works. Such a strategy is especially risky in the cannabis sector, which consists of a big number of newcomers (since the field itself is relatively new). A good portfolio should hold a range of stocks – the more the better. Having just one or a few positions is risky because of an obvious reason – the risk of huge financial loss is high. To put it in simple terms, you don’t put all of your eggs in the same basket if you want stability and long-term monetization. Companies that perform spectacularly well today could lose a large portion of stock value in the near future due to market pressures. Many first-time investors in the cannabis field rely on limited funds. They intentionally limit the number of stocks to control the overall cost of commission. Betting on one or two cannabis stocks can result in massive payoff but such a strategy is not a good one for low-risk players. If you want to control the risk, you should invest only a portion of your funds in cannabis stocks. Consider other ways to increase your currently available funds, as well. There are many things you can do to earn an income and if you want to, some of these funds can be invested in cannabis stocks. An empty room or an apartment you own could easily be entered into the Airbnb program. Click here to list your space and to start earning on Airbnb. This is just one example of a viable income generation approach. Click here to get additional ideas about making money online from your home in 2019. Be cautious, do your research and diversify. If you follow these simple steps, you will make the promising cannabis stocks work for you. Do you have any experience with cannabis stocks investing already? Which strategy delivered the best results and what are your plans for the future? Let us know what you think about cannabis stock investment in the comments below.